You are currently browsing the tag archive for the ‘pirate cooking’ tag. Those who know me know that I try my very best not to be a wasteful person. Need groceries? I have coupons. Something broke? Let’s figure out how to repair it ourselves. You’re hungry? There are leftovers in the refrigerator. In large pot, add broth, chicken, and chopped parsley; bring to boil and reduce heat. Simmer until chicken is cooked, then turn off heat. In a small bowl, mix flour, 1/4 tsp salt and 1/4 tsp pepper, set aside. In medium saucepan, melt butter over medium heat. Add celery, carrots and onion; cook for 5 minutes. Add dried thyme, 1/4 tsp salt and 1/4 tsp pepper; cook 5 more minutes, until veggies are tender. 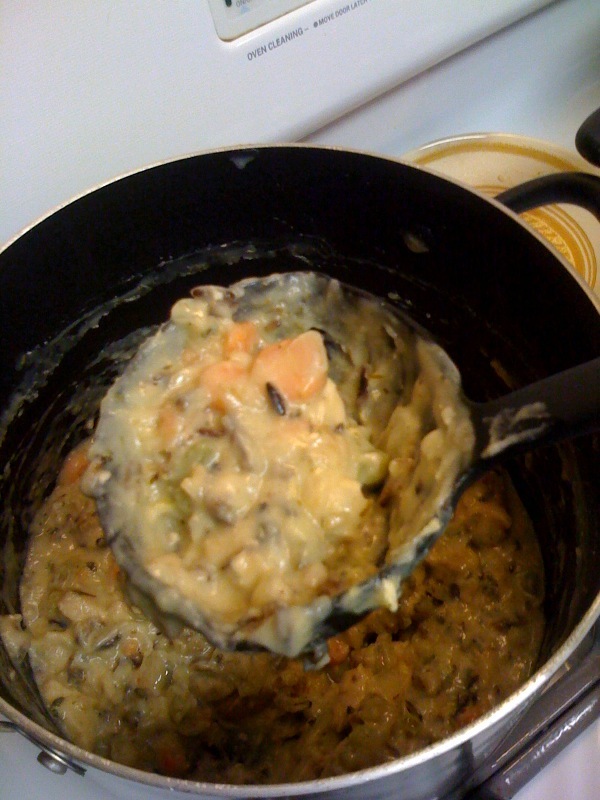 Gradually add flour mixture to veggies, while stirring constantly, to create a roux. (Go ahead and click on the link – I didn’t know what it was until about an hour ago.) Mixture will be soft and thick. Saute for another 3-4 minutes to cook out the raw flour taste. Add half-and-half or cream, again stirring constantly until smooth. Cook 5 more minutes, stirring occasionally. While that cooks, add your leftover rice to the chicken and broth and simmer (since the rice is already cooked, you only need it to warm up and let the broth absorb some of the seasoning). When creamy mixture is ready, add it to the chicken, rice and broth, and stir it up. Cook over medium heat for another 15-20 minutes and serve. Makes about 4-5 servings. This is what my soup looked like (again, mine was a little too thick; I'll use more broth next time).